Halloween Heart [W6765] - $13.98 : Yarn Tree, Your wholesale source for cross stitch supplies. Cross stitch design by Barbara Ana Designs. 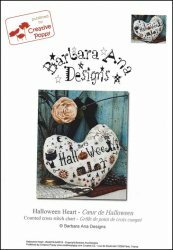 A fun heart shaped Halloween design from Barbara Ana. Some of the letters are substituted with whimsical Halloween motifs such as the flowers sprouting from the black boot. Instructions for mounting are included with the chart. Stitch count 168 x 126. Stitched on #8220 Belfast Linen Cream. Sand Aida 20 Short Cut 13"x43"
Sand/Parchment Aida 20 Short Cut 17.5"x43"